The Vietnamese Dong has been the official currency of Vietnam since 1973. It is known for its symbol “?” but is simply referred to as VDN in the foreign exchange market. The banknotes and coins are issued by State Bank of Vietnam. As of 2014, the average inflation rate for the Vietnamese Dong is at 4.1%. The word Dong originated from a Chinese word “tóng qián”, which is the same term used to refer to the Chinese bronze coins that were used as currency during the dynastic periods for Vietnam and China. Over the years, the Vietnamese currency has undergone major evolution. The history started in 1946 in North Vietnam. This was the same time when the Viet Minh government introduced the dong as the main currency. It replaced the French Indochinese piastre. In 1954, it evolved into South Vietnam and banknotes were released into circulation. This marked the first time when Dong banknotes were issued. Following the fall of Saigon in 1975, the name of the currency was changed to “liberation of Dong”. The reunification of Vietnam in 1978 also unified the Vietnamese Dong. The currency was also revalued as part of the unification process. The revaluation started a cycle of inflation that was to be the pattern until the 1990s. The history of Vietnam as a nation has largely contributed to its economic performance. When Vietnam was unified as a country, it was under the rule of a Communist government. The political and economic reforms that the government took helped for the Vietnamese economy to carve its own path in the world economic stage. The country has established diplomatic relations with major nations by the turn of the 21st century. In fact, the economic growth rate was considered as one of the highest in the region. Eventually, this has helped for collectors and investors to take notice of the Vietnamese Dong. Today, the Vietnamese Dong is available in various forms such as banknotes, coins and stamps. The relationship between the US Dollars and Vietnamese Dong is unique. Even though the Dong is not entirely dependent on the US Dollar, it is loosely pegged to the Dollar currency. The first series of Vietamese Dong coins were released in 1976. They were available in the following denominations: 1 hao, 2 hao, 5 hao, and 1 dong. The Berlin Mint of the German Democratic Republic was responsible for minting these coins. However, the chronic inflation resulted in these coins losing their value, which led to the stoppage of minting coins. The second series of coins for the Vietnamese Dong were released in 2003 by the State Bank of Vietnam. The new coins were minted by the Mint of Finland. These coins were available in the following denominations: 200, 500, 1,000, 2,000, and 5,000 Dong. The materials used were brass clad steel and nickel clad steel. The re-issuing of the coins helped to ease the need for the state to print banknotes with smaller values. For the banknotes, the first series was issued in 1978, which was the same year when the Vietnamese Dong became the official currency of Vietnam. The initial banknotes had the following denominations: 5 hao, 1 dong, 5 dong, 10 dong, 20 dong, and 50 dong. 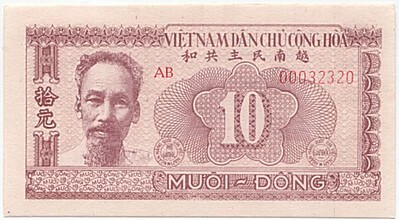 In 1981, the 30 and 100 dong notes were released into circulation. For the second series of banknotes, there were larger denominations that were printed to combat the growing inflation rate. The 200, 1,000, 2,000, and 5,000 Vietnamese Dong banknotes were released in 1987. Three years later, the 50,000 Dong became available. By 1991, another banknote was added, which is 20,000. Finally, more notes were issued in the years to come: 100,000 Dong (in 1994), 500,000 Dong (in 2003), and 200,000 Dong (in 2006).